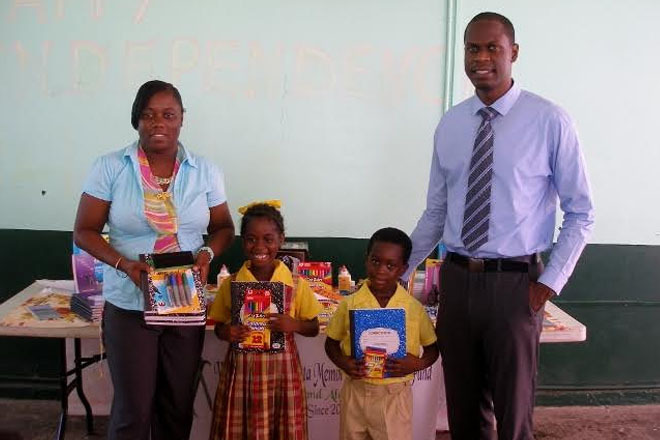 (ZIZ News) – On Thursday, the Tucker-Clarke and Irish Town Primary Schools received a cache of school supplies from the William Marcus Natta Memorial Scholarship Fund. The donation included more than three thousand items such as books, papers, pens and pencils for teachers and students. The fund’s Founder and Chairman, Dr. Marcus Natta outlined the importance of the donation. He said the scholarship fund, established in 2010, was created to encourage primary school students to strive for academic and civil excellence. “This is in memory of my father, who died when I was just 12 years old, but he was very much an advocate for education and for learning and he pushed us a lot to learn, as did my teacher who was also a teacher at Tucker Clarke Primary School; Newtown Primary School at the time. So we established this scholarship fund in order to give back to the school where three of his children attended,” Dr. Natta stated. Each year, two students of the Tucker Clarke Primary School are given financial assistance of between $500 to $2,000. The scholarships are awarded to one male and one female student based on financial need, academic excellence, sound moral, character and a sense of community service.